A Roll Off container is a large dumpster delivered to your project site. Tank’s offers a wide variety of Roll Off sizes to accommodate any project size. We deliver the empty Roll-Off container, you fill it, and we “roll off” with your rubbish for disposal and recycling. Simple as that! Roll Offs are favored by homeowners, businesses, and contractors for small- and large-scale renovations, cleanups, junk removal and landscaping projects. We can provide a range of sizes to fit your project: 15-, 20-, 30-, and 40-cubic yard Roll Offs. 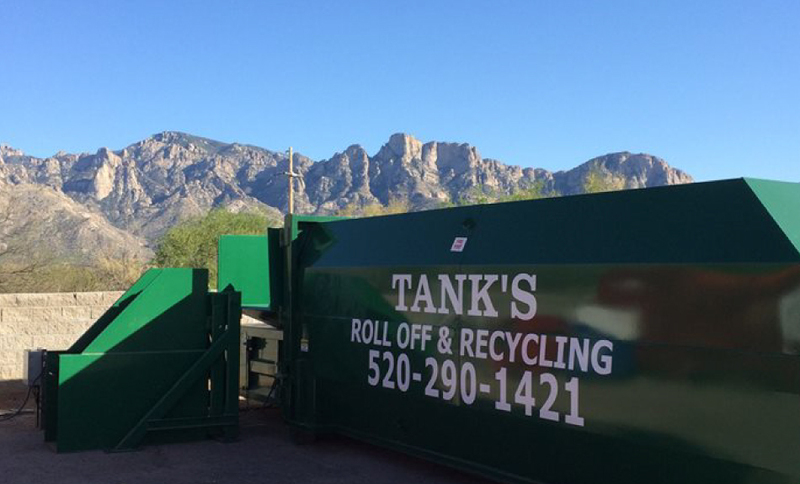 Tank’s Mini 15-yard Roll Off dumpster is perfect for residential clean-ups. Its 5′ height allows for loading over the sidewalls and holds about 7 pick-up truck loads of material. Tank’s 40-yard roll-off container is perfect for large construction jobs and clean-ups. We can also provide Portables (Porta-potty) restroom services with your roll off delivery. While Roll Offs can be used to haul away your waste, they can also be used to deliver materials like compost, topsoil, fill dirt, ABC aggregate, or decorative wood chips to be used in your project. The materials are dumped at your jobsite, then the empty container can remain on location. Then place any waste created from your project inside the emptied container, and we’ll remove it. Used in this way, they can be ideal solution for your next landscaping project. Acceptable waste materials for all Roll Off sizes include: All types of Non-Hazardous Construction and Demolition (C&D) materials such as wood, metal, and plastic, drywall, green waste, roofing, and cardboard. NO HOUSEHOLD GARBAGE, ASBESTOS, or HAZARDOUS WASTES. If waste materials are primarily inert such as concrete, dirt, sand, brick, etc., we suggest a 15- or 20-yard container so as not to exceed the legal road limit. Small quantities of inert materials are allowed in the 40-yard container, but the amount must not make the overall weight of 10 tons exceed the legal road limit. Call a Tank’s Roll-Off Customer Representative at 520-290-1421 or 1-800-721-TANK for more information. Need more than one roll off? We have a Special Pricing Program for customers that order multiple roll offs to the same job site. Ask if you qualify. 15 cubic-yard, 20 cu-yd, 30 cu-yd, 40 cu-yd. Delivery locations outside of our main Tucson delivery area may be subject to an additional delivery fee for the delivery of the roll off container. Please speak with a Tank’s Roll-Off Customer Representative at 520-290-1421 or 1-800-721-TANK to inquire about your delivery area. 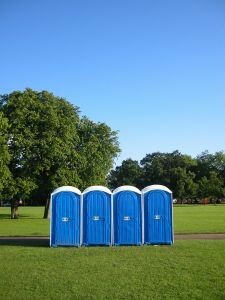 We also offer Portable (Port-a-Jon) restroom rental, with weekly restroom service in addition to Roll Offs. Standard, Standard w/Sink, Handicapped Units, and Handwash Stations available. Please call 520-290-1421 or 1-800-721-TANK for details and pricing. Click Here for Roll Off ‘Service Terms & Conditions’. Staff will obtain a signed copy of Agreement (sign on page 2) at time order is placed. HOW BIG IS THE TRUCK? Click here to see truck sizes and dimensions. "Tank's Roll Off and Recycling is a great company. The service we get from Tank's Roll Off is professional, on time, and always satisfactory. The folks in the office are a pleasure to work with. I highly recommend Tank's Roll Off to anyone in need of this service." -Patti Cutler, Human Resources Director, Cutler Landscaping, Inc.
"I highly recommend Tank's Roll Off services. You get the same great customer service with anybody that has worked with Fairfax Company. It was delivered really quickly, and at a very competitive rate. Another great product from Fairfax, and good to know that our waste is being recycled into quality compost. Thanks Tanks!" 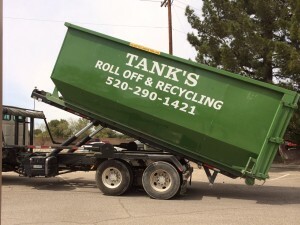 "So glad Tank's Roll Off is here in Tucson! We were clearing out a large area of natural landscape for a project and needed to get rid of the green waste. We didn't want it to go to the landfill, so we called Tank's. They were so accommodating, and were able to deliver a large roll-off that week. They arrived right on time, were polite and helpful, and arranged for a pick-up when we needed it. Great customer service, and a great service to our environment and community. We would use them again for other waste management needs." "I needed to get rid of some yard waste, cactus, and mesquite branches. I liked Tank's Roll Off service very much, and love that is recycled. That was important to me. I prefer to recycle when I can rather than put into the landfill." "I recently rented a 40 cu. yd. dumpster from 'Tank's Roll Off' and was very pleased with the endeavor. Delivery and pick up was prompt and the equipment was in excellent condition. Overall, a pleasant and smooth transaction." Check out Tank's Roll Off on Facebook for photos and specials!